The marketing department of an organization needs to come up with new strategies to attract more customers and in the bargain enhance its revenues. This being a team work, meetings are held to brainstorm over new ideas and discuss any strategies. Such meetings can sometimes go on for long hours. Then, there may be times when some participants have no clue as to what the meeting is about. You can also see Blank Meeting Agenda Templates. 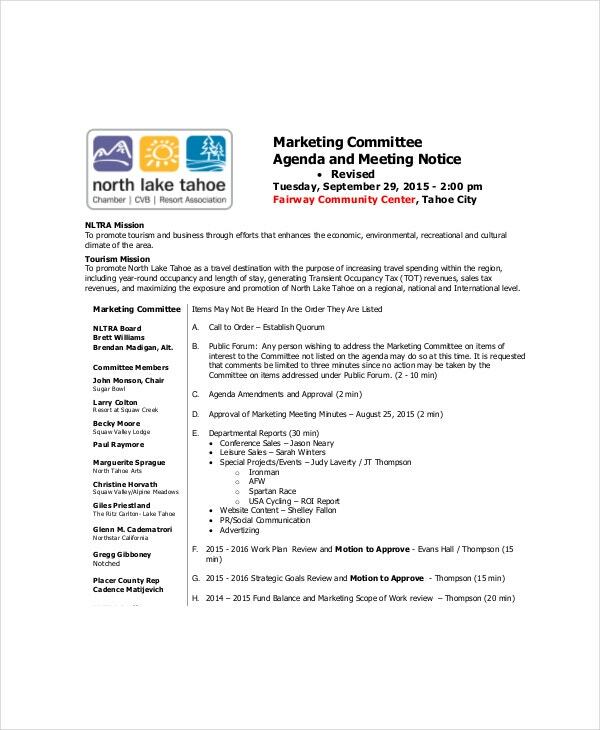 An organized touch can be given to these meetings by using a marketing meeting agenda template. Adding all the topics to be discussed, allotting a time slot for each topic and then sharing it with the participants can make the meeting more effective. The marketing team needs to get together every now and then to think of newer ways to enhance the sales of the company. However, it is important that the participants have a preconceived idea about the meeting. 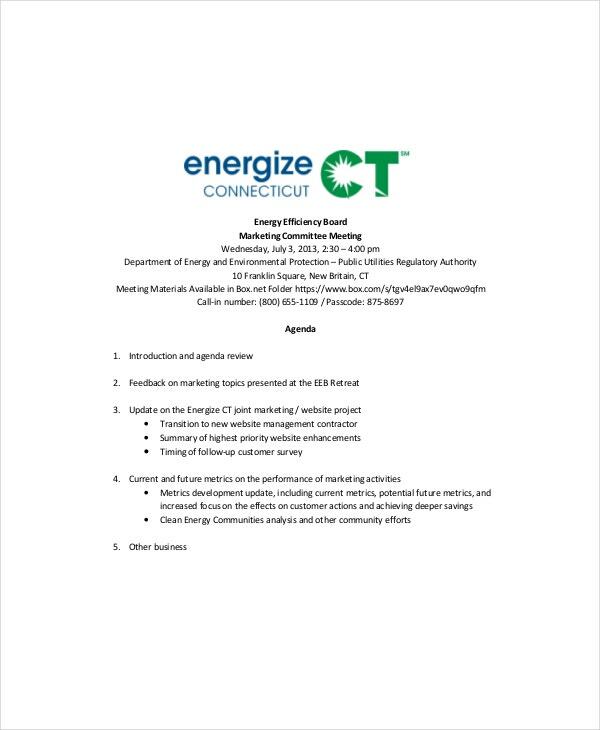 This is where the meeting agenda template comes into play. Filling it with the important topics and sharing it with the participants would help them get ready for the meeting. Gauging the success of the strategies introduced into the market is also an important function of the marketing team. Once the results are in, a meeting agenda should be prepared with all the results and floated among the participants. This would give them enough time to come up with their queries and ideas about the feedback. A fixed budget is allotted to the marketing department for its work. Thus, to ensure that the optimal use of the budget is made, the team needs to discuss the right way to allot the budget. 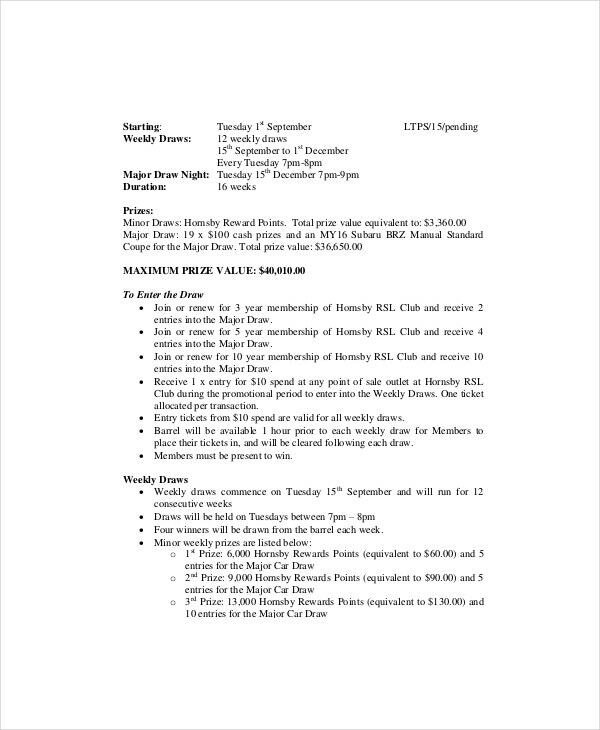 Sharing a marketing budget meeting agenda will give all the participants, ample time to come up with their own ideas. The marketing department usually makes use of different vendors to work on their strategies like advertising agencies, content creators, logo designers etc. 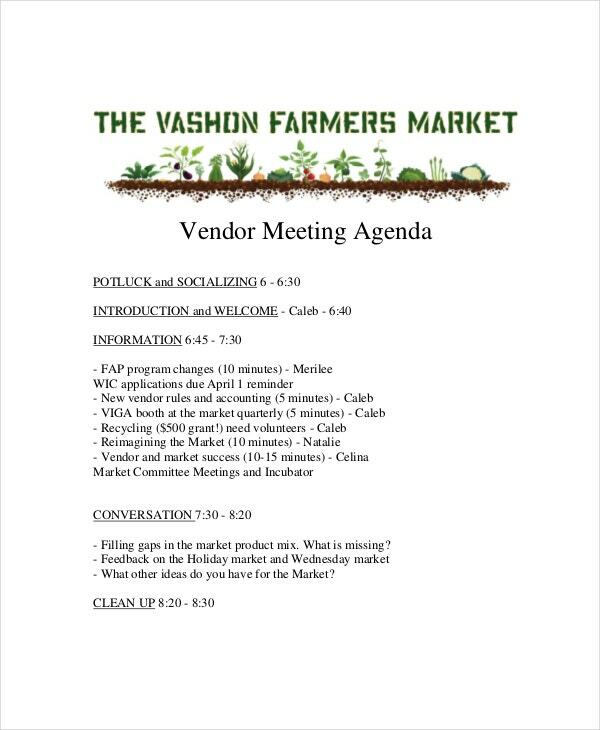 The choice of the vendor has to be a unanimous decision for which meetings may be held. 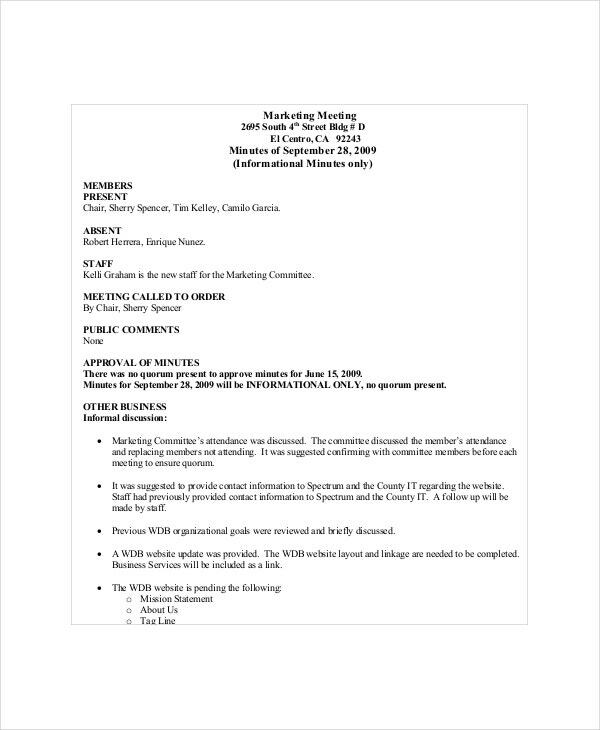 By using a meeting agenda template, all the participants can be informed about the vendors about whom decision has to be made. 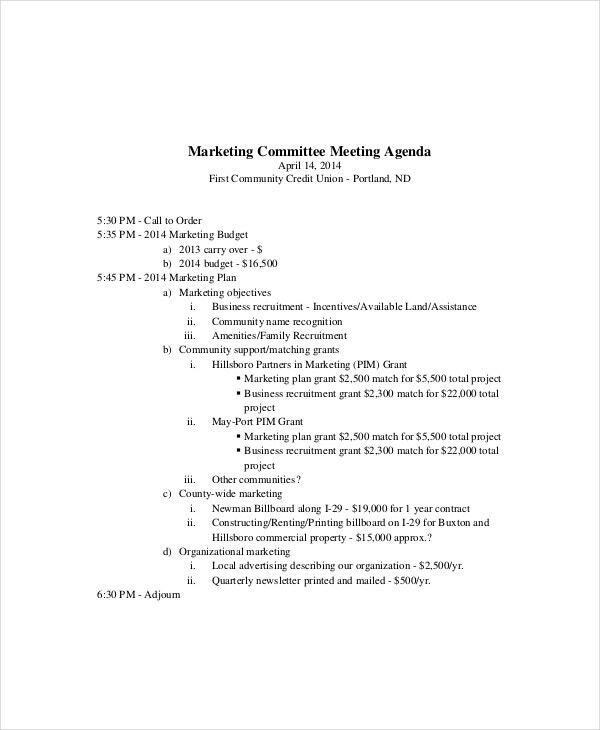 This is a standard design of a marketing meeting agenda template. 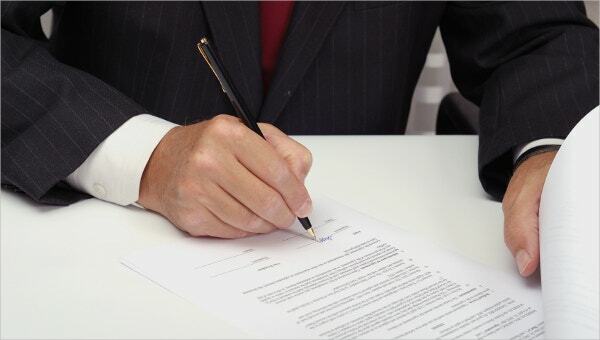 It consists of all the prerequisite segments that are an integral part of a meeting agenda. This can be customized as per the requirement of the meeting. You can also see Agenda Templates. It is important to add in all the topics that should be discussed in the meeting. Do not forget to allocate a time frame for each topic to ensure that the meeting adheres to the time frame. Refrain from adding in topics which are not very crucial and can be handled later. You can also see Agenda Planner Templates. 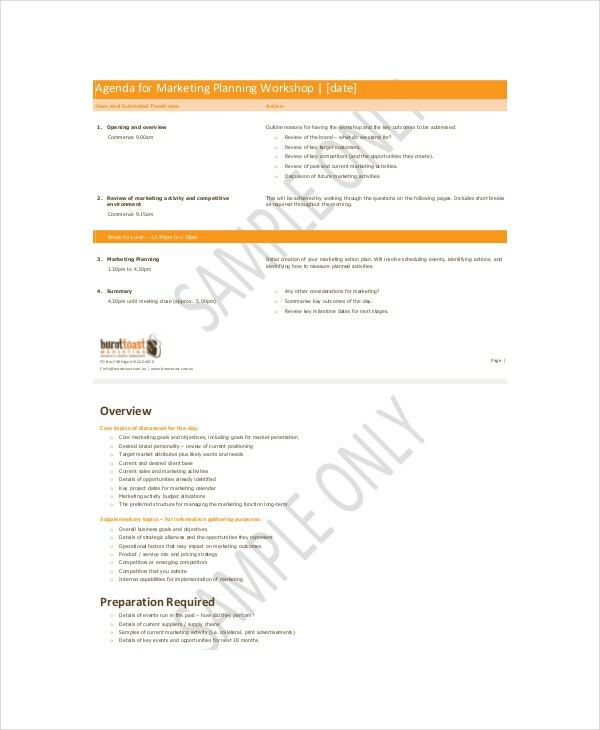 We have a number of marketing meeting agenda template which can be easily customized and are ready to be printed. These are available in both MS Word and PDF formats which are compatible with all operating systems. In case, you want us to make any changes to these templates, we are open to suggestions.